The Upper Cumberland Regional Health Facility project answered the need for a larger space to accommodate recent and projected growth of the regional health department. The program was divided into four essential functions: administrative spaces, a conferencing center, a clinic, and general building services. The goal was to provide a healthier indoor environment with access to natural daylight and views, a cleaner environment with fewer CO2 emissions, and lower monthly utility bills. The use of sustainable strategies shaped the building’s form and function. The green building design focused on minimizing environmental impact as well as maximizing daylight, energy efficiency, and indoor environmental quality. 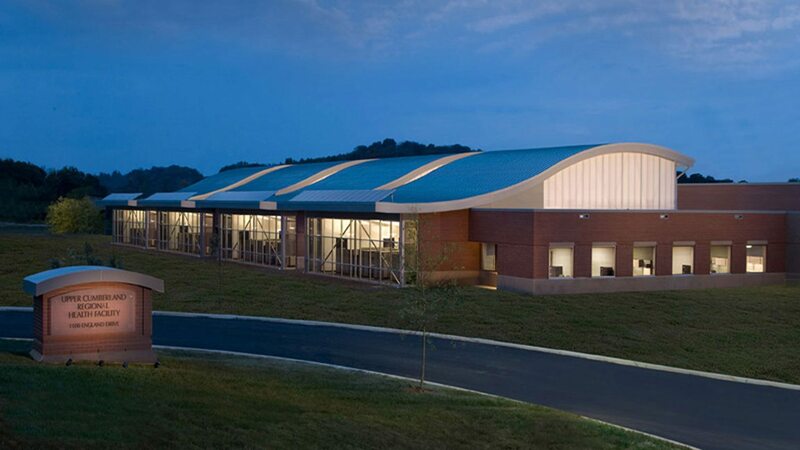 The project was the first Tennessee state-owned facility to achieve Platinum level certification utilizing the USGBC LEED version 2.2 Green Building Rating System. Local materials incorporated in both interior and exterior finishes reflect the region, promote local economy, and reduce the environmental impact of transporting supplies. A main circulation path connects the clinic, warehouse, and conference center to the administrative spaces via a central spine. Construction of a scale model tested daylighting design for the administration wing and analyzed the impact of side clerestory windows. Rolling 10 acre site provides high visibility from I-40 westbound, and its east-west direction lends to proper solar orientation. Building footprint and minimal parking lot layout oriented to facilitate natural stormwater management systems. The unbuilt design of the Upper Cumberland Regional Health Facility won a Middle Tennessee AIA award in 2008.